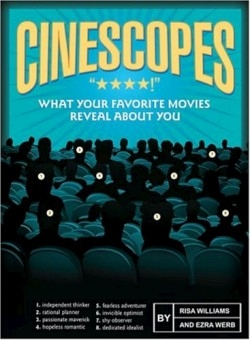 Risa Williams, who holds a master’s in psychology, and Ezra Werb, with a degree in film studies, have come up with a horoscope for anyone who believes in good movies. Surely everyone has a favorite movie or two, and that, claim the authors, is all it takes to shuffle and analyze personality. It’s very simple. Make a list of your top ten favorite flicks. (If you get stuck, go to the index and wander through the stacks.) Then, from this glossary, jot down the codes that follow the film titles. Whichever two-letter code occurs most often is your Cinescope. For example, if you’re a Destined Hunter, you “have the ability to look evil in the eye and tell it where to go.” One of your favorite movies might be Unforgiven, or Die Hard. On the other hand, if you’re a Rebellious Lover, your favorites might be Out of Africa, or Closer. An Existential Savior will go for I Heart Huckabees, while a Dedicated Idealist will love movies like Wall Street. The film glossary occupies about twenty percent of the book, and is both contemporary and replete with classics. A good amount of foreign fare fills out the menu. A Web site keeps it up-to-the-minute. Unabashedly unscientific guilt-free fun, this is a great gift or waiting room book.